Special thanks to AJ of The Classic Red Green Page who asked us how Lee’s Game Boy modding from our Scary Books and Stuff podcast episode back in October went and requested it as a podcast topic. We’re nothing if not punctual. Or the opposite. 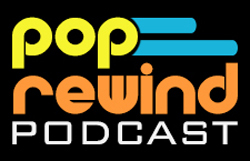 In this episode of the Pop Rewind Podcast, Linz and Lee venture down the path of retro handheld gaming and Lee goes on a Back to the Future Rant (TM). Lee’s Taco Bell color scheme Game Boy! Linz has really been into Teen Titans Go! She also recommends playing “Weird Al” Dungeons & Dragons. Lee is all about the Nintendo Switch Game “Late Shift”, which apparently has nothing to do with the Letterman vs. Leno Late Night wars. Who knew! Is Linz the only person that still plays Pokemon Go? Hit us up on Twitter at @PopRewindOnline and let us know! #TeamLee if you’re like Lee and don’t play anymore, or #TeamLinz if you gotta catch ’em all! Thanks for the shoutout guys! Was a fun episode to listen to! Have got my mod plans on hold while I finish up a course (damn night school!) but am planning to be back at trying in August!